A wordsmith by profession and calling, I understand the significance of the written and spoken word. I’m a big proponent of vision boards and have purposefully practiced writing down my goals, in various formats, for over a decade. That’s precisely why what I’m about to say next may sound tantamount to treason for other word loyalists who espouse lofty ideals on their journal pages and Word documents, and whose creations cause others to reflect and reexamine their lives. Words aren’t enough. Just as faith without works is dead, dear scribes, words without actions can’t go anywhere. They simply remain on the page. One in five children in America is at risk of hunger; for blacks and Latinos, it’s one in three. Those are the words. What are we going to do about that? That is the action. We need to start moving beyond words. We need to stop writing down our goals if we won’t implement the necessary steps to take it to the next level. We need to stop talking ad nauseum about what we’re going to do and start actually doing it. Do you know someone who has been telling you what they are going to do for at least several years now, and yet – year after year – nothing changes? They are no further along. I think if we’re honest, many of us have once been that person — at least in one area of our lives. There’s a phrase I use often to describe this phenomenon, where words never progress to actions: The never-ending conversation. The perpetual talk. “Fittin’ to’ is a thief and a robber. It stops you from using your time wisely. You have delayed so long, that your will has lost respect for your word. So, you’re lying to yourself,” Bishop T.D. Jakes explained during one sermon. Nothing can be accomplished until we move from lip service to action. There is something so powerful about taking action. It is such a powerful force. I find that when I take action in one area of my life, like dominoes, things start to shift in other areas. Essentially the difference between what we say and what we do boils down to how bad we want something; how significantly we are being pulled to change. 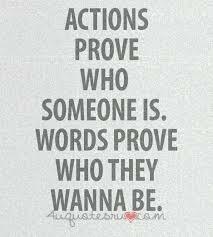 And the answer to that is always proven by our actions, not our words.